Why? Wicked king Ahab, and people had turned away from the Lord God AGAIN (do you ever do the same wrong things AGAIN?). It was God who had made them, and given them the good land they lived in. Ahab told the people "Baal is God!" Baal was a false, make-believe god, the god (so they said) of storms and rain and lightning. King Ahab's wife Queen Jezebel was the princess of Tyre, where Baal was already worshipped. They thought Baal was cruel, and even killed people as human sacrifices to Baal. God's last prophet, Elijah (his name means "The LORD is my God"), is really sad because they had deserted God. He prayed to God to stop the rains. God did, and sent Elijah to tell the King it would not rain for 3 years! We in Australia know all about droughts, and that is just what happened in the land of Israel. Crops died, cattle and sheep died, and the people were hungry. You might be thinking "no one I know bows down before a home-made god like Baal". But many other things can be idols, false gods. If people will cheat and steal to get money, or make others sad so that they can be happy, or spend all their time and money on bikes or cars or looking beautiful, then you can be sure they have an idol - money, or pleasure, or being popular, or being a big-shot. King Ahab sends his soldiers to catch Elijah, but they can't. God won't let them. But, at the end of 3 years of drought (a long lesson!) the time is right. 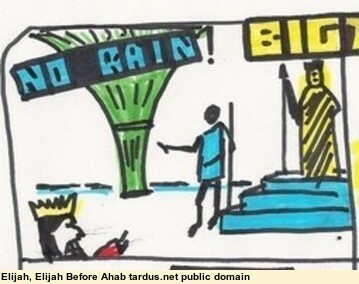 God tells Elijah it is time for rain again, but first Elijah must go and meet King Ahab. When King Ahab saw Elijah, the King said "You troublemaker! - it's you that has brought all this trouble on my country Israel". 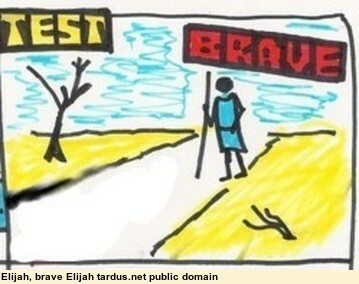 Elijah BRAVELY said to the King "It's not me that has troubled Israel, but you King! You deserted the true God and started this worship of Baal, who is no god at all!" "It's time to prove it" he said. "Call all the people to meet me at Mount Carmel (right in the middle of Baal territory), and all the hundreds of prophets of Baal." Elijah is giving orders to the King (he can, because he serves a much greater King - the Lord God Himself, who made us and all the world). What is Elijah going to do? When a great building, or a dam, or a bridge, is being built, there is a lot of testing to be done. The concrete has to be tested. The steel has to be tested, and even the ground has to be tested. Why? to make sure everything is strong enough to stand the weight of the building, the pressure of the water, and the weight of trucks and cars. So Elijah invites the King and all the people to a BIG DAY for a BIG TEST. 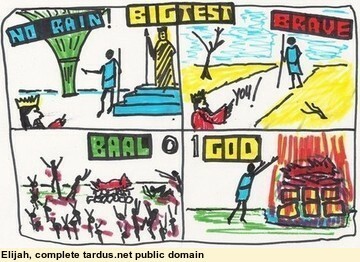 Let's see who is the real God; Baal or the LORD? 450 Baal-ite prophets to 1 for the LORD - Elijah. He tells the crowd to get 2 bulls, one for Baal, one for the LORD (the custom was to sacrifice an animal). 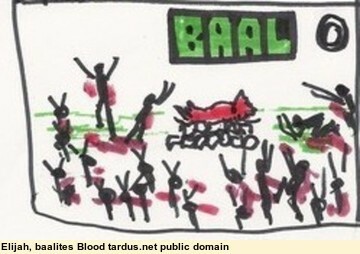 "You Baal-ites pick your bull first!" he calls out. "Make your altar, cut up the meat, but no fire!. Call on your god Baal to send the fire. Then I will do the same for the LORD. Whoever sends the fire is the true God." The people said "Good idea!" Prophets of Baal cut up a bull, place the pieces on the wood on their altar. Then they called out "O Baal, answer us!". There was no answer. They kept it up all morning, shouting and dancing, but still no answer. About lunch-time Elijah begins to make fun of them. "Shout louder! He is a god, isn't he"
"Maybe he's having a bad day"
It's getting late, the afternoon has passed, and still NO ANSWER. He begins to dig - a trench all around the altar - what for? 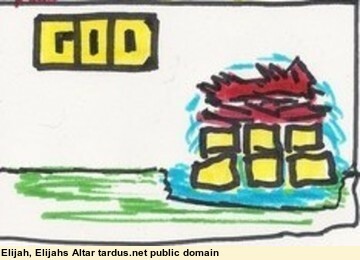 He calls for water - 4 large buckets full - and they pour it over the meat on the altar. "And a 3rd time!" - the water runs over the meat, soaks the firewood, runs down the stones and fills the trench around the altar. Ever try to light wet firewood? "O LORD, God of Abraham, Isaac and Israel, let it be known today that you are God in Israel and that I am your servant and have done all these things at your command. Answer me, O LORD, answer me, so that these people will know that you, O LORD, are God, and that you are turning their hearts back again." and even the water in the trench! Elijah orders the people "Grab all these wicked prophets of Baal, don't let any escape!". The people catch them all, and these men who caused so much evil and suffering are all put to death. Will you also serve the One and Only God? Will you say "The LORD, He is God!" "The LORD, He is MY God." There is no other - He is God who made the whole world, and He made all of us. It is both good and right that we all worship and serve Him. There is no other path that leads to happiness.